Tracing different types of lines is one of the early development skills that kids need to prepare for writing. The fun and colorful activities featured in this fun pack will help your little ones develop the muscles needed for early handwriting success. They will allow younger students to trace lines in a variety of strokes and paths that will help increase their fine motor tracing skills. Your children will have fun as they are provided with these interactive opportunities for them to enhance their Preschool and kindergarten Fine Motor Skills. These entertaining Halloween activities are excellent for young children as young as 2 years old and preschoolers. It is an excellent product for preschool, but this set can also be used for your kindergarten student who may need extra fine motor skill development. 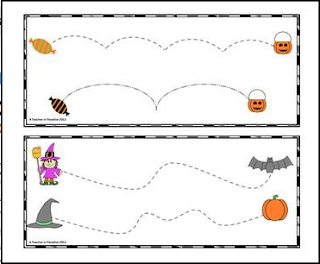 Enclosed in your download you will find 12 wipe off color mat strips which can be placed on rings for your students. Thanks for downloading and enjoy.